What Do Amara Organics Vitamin C Serum Reviews Tell Us? 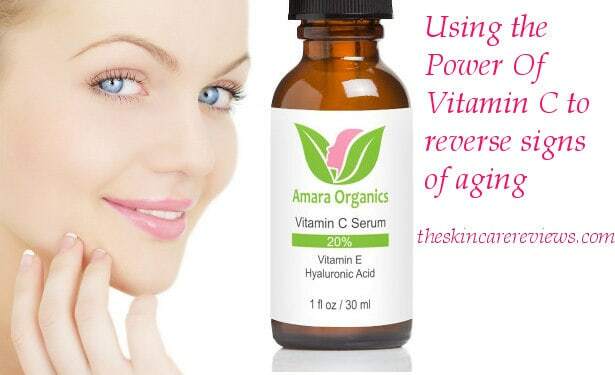 Reviews about Amara Organics Vitamin C serum are overwhelmingly good as to the positive effects it has on the skin. This serum has got some features that make it really stand out from other vitamin C serums and below I will explain what makes this product different and favored by so many women. What Are The Strong Points Of Amara Organics Vitamin C serum? According to the company, it contains 20% potent vitamin C that is of the highest quality available. Vitamin C is powerfully combined with vitamin E and hyaluronic acid to maximize the effectiveness of the product. Plant based ingredients which most of them, I have found, are organic. No alcohol or parabens are used and no animal testing has been performed. 365 day full money back guarantee is provided no matter where you purchase this serum from. Excellent company service which helps you with detailed instructions and is interested in finding out whether you are 100% pleased with their product. Vitamin C serums are used as powerful anti aging tools but not all vitamin C serums can be equally effective. Amara Organics Vitamin C serum due to the potency of vitamin C included, the combination of vitamin C, vitamin E, hyaluronic acid and other plant based ingredients makes a formula that has lot of benefits for the skin’s staying more youthful and healthy looking. It is a well known fact that vitamin C boosts collagen so this serum helps you increase collagen’s production, making it easier for you to have a more elastic complexion. It also softens fine lines and wrinkles, reducing and making them less visible. The antioxidant properties of this serum stop the damaging function of the free radicals which is one of the main causes of aging. It also reverses the damage which is caused by the sun, pollution of the atmosphere and the negative effects of smoking to the skin. In conclusion, this product works as a protective shield against all those factors which make your complexion more vulnerable to aging. It protects from the sun damage which can often be seen on the skin in the form of discoloration, age spots or fine lines. Improves the skin texture, making it smoother and brighter. Water, Vitamin C, Aloe Vera Extract, Botanical Hyaluronic Acid, Vitamin E, Methylsulfonylmethane (MSM), Witch Hazel, Hydroxyethyl Cellulose, Kosher Vegetable Glycerin, Organic Jojoba Oil, Carrageenan Gum, Organic Gotu Kola Extract, Sodium Benzoate, Potassium Sorbate, Organic Geranium Extract, Ethyl Hexyl Glycerin, Organic Horsetail Plant Extract, Organic Dandelion Extract. Take a small amount and with your fingertips apply it onto freshly cleansed face, your neck or decollete. Give it some time to get absorbed by the skin and then you can also wear your moisturizer. This serum can be used every day. What Do Amara Organics Vitamin C Serum Reviews Say? In their majority, user reviews are enthusiastically positive. People are thrilled with the obvious results they see on their skin, stating that they love this serum. A lot of them mentioned that their fine lines and wrinkles went softer and less, making their skin look a lot more youthful and pretty. Radiant and smoother complexion was also a fact for a lot of the people who have made use of it. This serum absorbs quickly into the skin making it more firm and shrinking the pores. A lot of the people use it also on their neck to deal with sagginess as well as hands for brown spots. It can also help with acne scars and is used to prevent breakouts. A few people with dry skin issues have also reviewed that it has softened dry patches of skin. Finally, users are very satisfied with the way the serum’s dropper works which is a lot better relating to other serums they have used so far. To be honest, I really tried hard to find some negative reviews concerning this serum but the only few negative comments I could dig was that either users haven’t used it long enough to be really sure about the amount of benefits it had or others thought it was a bit light and weren’t so thrilled by the product’s efficiency. Overall, the reviews were very positive with people of all ages saying that this serum has improved the whole appearance of their skin, making it look a lot more youthful, radiant and with less fine lines and wrinkles. After doing my Amara Organics Vitamin C Serum review what I have to say is that this serum is a very good choice among the hundreds of vitamin C serums that can be found on the market today. It contains 20% of vitamin C and together with vitamin E, hyaluronic acid and other organic ingredients, what you get is a strong antioxidant and therefore anti aging boost for your skin which is only but needed after a certain age although there are a lot of people using it even in their early 20’s to prevent aging and get a brighter complexion. The fact that this serum is followed by a 365 day money back guarantee makes its purchase even more appealing.